Hedgeye - Did The Fed Just Make Another Mistake? Did The Fed Just Make Another Mistake? This is really a trick question. It’s not hard to argue that another interest rate hike this week, along with a clear indication that there are more hikes to come and that quantitative tightening will go on come hell or high water, was, indeed, a mistake. None other than Stanley Druckenmiller recently made such a case in arguing for a pause in the Fed’s monetary tightening campaign. Economic growth outside the U.S. decelerated over the past three months. Global trade growth also slowed markedly, running about one-third lower than earlier in the year. Growth in some important economies, like China, is significantly weaker. No ocean is large enough to insulate the U.S. economy from slowdowns abroad. And no forecasting model adequately captures the spillovers and spillbacks between the U.S. economy and the rest of the world. U.S. financial-market indicators also signal caution. Market prices may be showing their true colors for the first time since QE’s expansion. These indicators aren’t foolproof, but they have a better track record than economists. Bank stocks are down about 15% since Oct. 1. Other economically sensitive sectors, like housing, transport and industrials, are down by double digits, underperforming the broader markets. Credit markets are softening, and the decline in major commodity prices is foreboding… Given recent economic and market developments, the Fed should cease—for now—its double-barreled blitz of higher interest rates and tighter liquidity. Thus it’s hard to imagine Druck wouldn’t see yesterday’s rate hike and relatively hawkish language as yet another in a long series of Fed mistakes. But Druck would also be the first to point out to Jay Powell’s critics that the real mistake was not made yesterday but over the past decade by his predecessors. Probably in my mind the poster child for a central bank mistake was actually the U.S. Federal Reserve in 2003 and 2004… we had great conviction that the Federal Reserve was making a mistake with way too loose monetary policy… So that’s why, if you look at today… I’m experiencing a very strong sense of deja vu… If you look to me at the real root cause of the financial crisis, we’re doubling down. Our monetary policy is so much more reckless and so much more aggressively pushing the people in this room and everybody else out the risk curve that we’re doubling down on the same policy that really put us there and enabled those bad actors to do what they do. 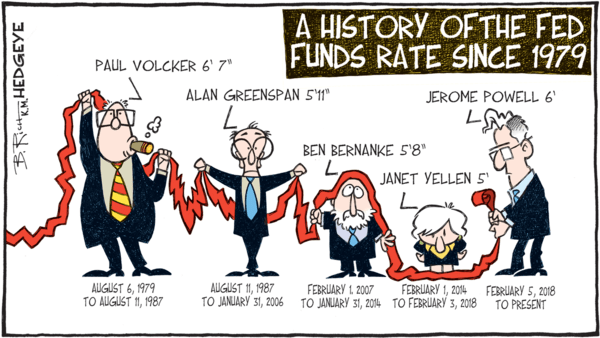 The real mistake the Fed made was keeping monetary policy far too loose for far too long. A decade of ZIRP and QE allowed and inspired all sorts of imbalances to be built up in both the economy and in the financial markets and to an even greater extent than the last time the Fed was too loose for too long. So it’s valid to say that Jay Powell should have been more dovish this week than he was but it’s important to remember that the economy and the markets are only as fragile as they are today because his predecessors lacked the courage he apparently doesn’t. So what’s an investor to do? I have no doubt Druck is looking at this as an opportunity. He also told those at the Lost Tree Club, “80% of the big, big money we made was in bear markets and equities because crazy things were going on in response to what I would call central bank mistakes during that 30-year period.” Considering this may be the most overvalued stock market of all time, there should be plenty of room to profit from the downside for those not swept up in the passive investing mania.